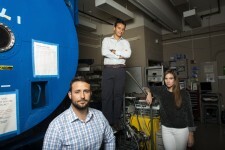 Seen here in the Space Propulsion Laboratory near a large vacuum tank, Department of Aeronautics and Astronautics Ph.D. candidates Natalya Brikner and Louis Perna (light shirt) have been working on the ion Electrospray Propulsion System (iEPS) for CubeSats at MIT in Cambridge, Massachusetts, USA. The device is used to maneuver a 10cm cubic satellite in space. Brikner and Perna have formed a company, Accion Systems Incorporated, to commercialize the research. Brikner, graduating in Winter 2014, is CEO of the company, and Perna is co-founder. The research at MIT was done under Space Propulsion Lab director Paulo Lozano, professor in MIT's Department of Aeronautics and Astronautics. Aeronautics and Astronautics Ph.D. candidate Louis Perna is seen here in the clean room of the Technology Research Laboratory in the Microsystems Technology Laboratory at MIT in Cambridge, Massachusetts, USA. 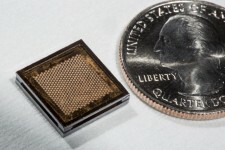 Perna is reflected in a silicon wafer from which he creates both the extractor grid and emitter chip frame for the ion Electrospray Propulsion System (iEPS) for CubeSats project at MIT. 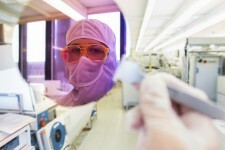 One side has a purple hue due to 300 nanometers of oxide grown on the wafer. Researchers in the cleanroom have to wear a bunny suit or clean room suit while working to prevent contamination. Perna works on silicon MEMS fabrication and packaging in the ion Electrospray Propulsion System (iEPS) for CubeSats project at MIT. The iEPS device is used to maneuver a 10cm cubic satellite in space. Two Ph.D. candidates working on the project, Natalya Brikner and Louis Perna have formed a company, Accion Systems Incorporated, to commercialize the research. Brikner, graduating in Winter 2014, is CEO of the company, and Perna is co-founder. 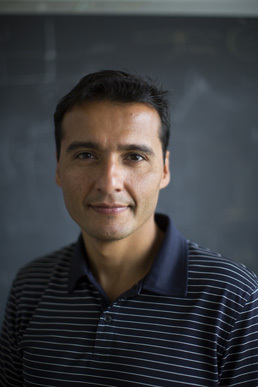 Dr. Paulo Lozano is the director of the Space Propulsion Laboratory in MIT's Department of Aeronautics and Astronautics in Cambridge, Massachusetts, USA. One of the projects developed by the lab is the ion Electrospray Propulsion System (iEPS) for CubeSats. The device is used to maneuver a 10cm cubic satellite in space. 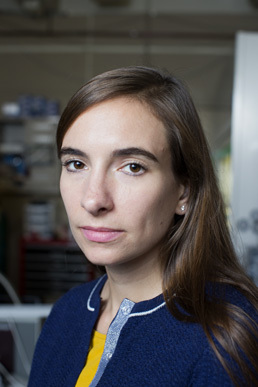 Ph.D. candidates and researchers in the lab Natalya Brikner and Louis Perna have formed a company, Accion Systems Incorporated, to commercialize the research. Brikner, graduating in Winter 2014, is CEO of the company, and Perna is co-founder. The research at MIT was done under Space Propulsion Lab director Paulo Lozano, professor in MIT's Department of Aeronautics and Astronautics. 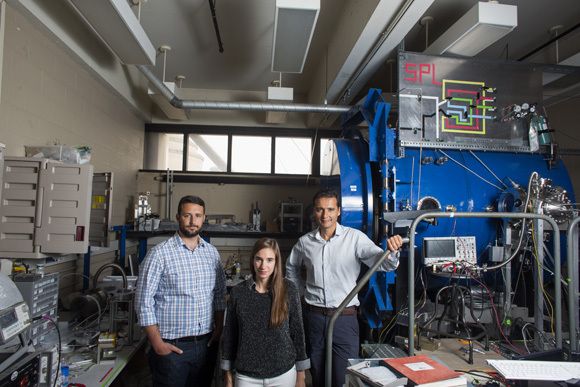 Seen here in the Space Propulsion Laboratory, lab director Dr. Paulo Lozano (right), and Ph.D. candidates Natalya Brikner and Louis Perna (left) have been working on the ion Electrospray Propulsion System (iEPS) for CubeSats at MIT in Cambridge, Massachusetts, USA. The device is used to maneuver a 10cm cubic satellite in space. Brikner and Perna have formed a company, Accion Systems Incorporated, to commercialize the research. Brikner, graduating in Winter 2014, is CEO of the company, and Perna is co-founder. The research at MIT was done under Space Propulsion Lab director Paulo Lozano, professor in MIT's Department of Aeronautics and Astronautics. Aeronautics and Astronautics Ph.D. candidate Louis Perna is seen here in the clean room of the Technology Research Laboratory in the Microsystems Technology Laboratory at MIT in Cambridge, Massachusetts, USA. 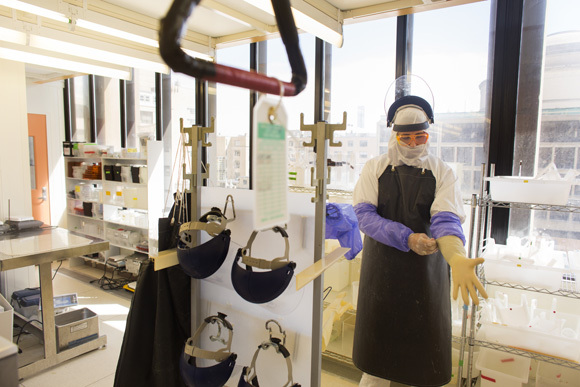 Perna is putting on an additional apron and other personal protective equipment that is used to protect researchers from corrosive chemicals used in the lab. 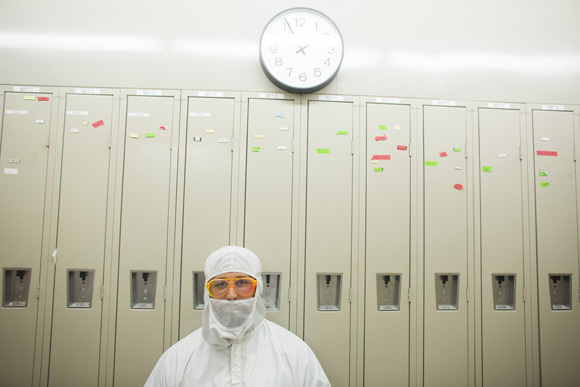 Researchers in the cleanroom have to wear a bunny suit or clean room suit while working to prevent contamination. Perna works on silicon MEMS fabrication and packaging in the ion Electrospray Propulsion System (iEPS) for CubeSats project at MIT. The iEPS device is used to maneuver a 10cm cubic satellite in space. 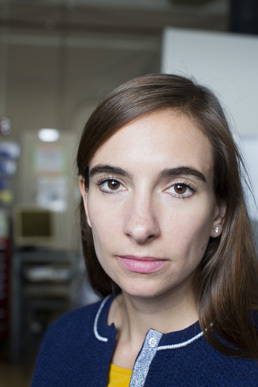 Two Ph.D. candidates working on the project, Natalya Brikner and Louis Perna have formed a company, Accion Systems Incorporated, to commercialize the research. Brikner, graduating in Winter 2014, is CEO of the company, and Perna is co-founder. Seen here in the Space Propulsion Laboratory, Aeronautics and Astronautics Ph.D. candidate Natalya Brikner has been working on the ion Electrospray Propulsion System (iEPS) for CubeSats at MIT in Cambridge, Massachusetts, USA. The device is used to maneuver a 10cm cubic satellite in space. Brikner, alongside fellow Ph.D. candidate Louis Perna, has formed a company, Accion Systems Incorporated, to commercialize the research. Brikner, graduating in Winter 2014, is CEO of the company, and Perna is co-founder. 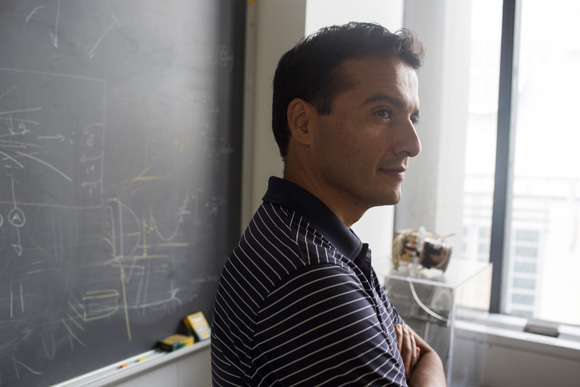 The research at MIT was done under Space Propulsion Lab director Paulo Lozano, professor in MIT's Department of Aeronautics and Astronautics. Seen here in the Space Propulsion Laboratory, lab director Dr. Paulo Lozano (center), and Ph.D. candidates Natalya Brikner and Louis Perna (left) have been working on the ion Electrospray Propulsion System (iEPS) for CubeSats at MIT in Cambridge, Massachusetts, USA. The device is used to maneuver a 10cm cubic satellite in space. Brikner and Perna have formed a company, Accion Systems Incorporated, to commercialize the research. Brikner, graduating in Winter 2014, is CEO of the company, and Perna is co-founder. The research at MIT was done under Space Propulsion Lab director Paulo Lozano, professor in MIT's Department of Aeronautics and Astronautics. The ion Electrospray Propulsion System (iEPS) for CubeSats is made by MIT's Space Propulsion Lab in Cambridge, Massachusetts, USA. The device, shown here next to a US quarter for scale, is used to maneuver a 10cm cubic satellite in space. The Space Propulsion Lab is directed by Dr. Paulo Lozano, professor in MIT's Department of Aeronautics and Astronautics. 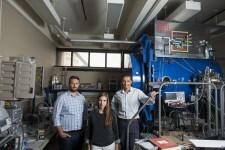 Two Ph.D. candidates working on the project, Natalya Brikner and Louis Perna have formed a company, Accion Systems Incorporated, to commercialize the research. Brikner, graduating in Winter 2014, is CEO of the company, and Perna is co-founder. Aeronautics and Astronautics Ph.D. candidate Louis Perna is seen here in the clean room of the Technology Research Laboratory in the Microsystems Technology Laboratory at MIT in Cambridge, Massachusetts, USA. 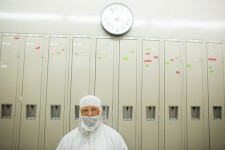 Researchers in the cleanroom have to wear a bunny suit or clean room suit while working to prevent contamination. Perna works on silicon MEMS fabrication and packaging in the ion Electrospray Propulsion System (iEPS) for CubeSats project at MIT. The iEPS device is used to maneuver a 10cm cubic satellite in space. 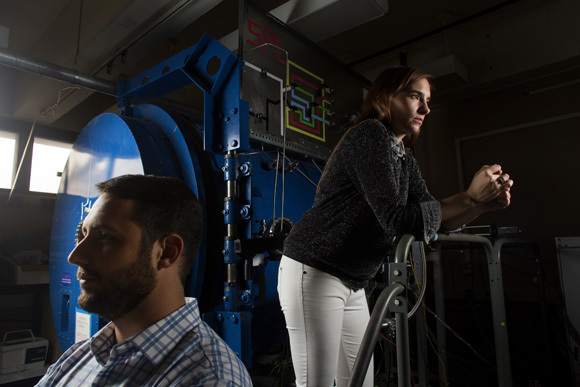 Two Ph.D. candidates working on the project, Natalya Brikner and Louis Perna have formed a company, Accion Systems Incorporated, to commercialize the research. Brikner, graduating in Winter 2014, is CEO of the company, and Perna is co-founder. A couple weeks ago I had a short time in MIT’s Space Propulsion Lab photographing some of the team behind the ion Electrospray Propulsion System (iEPS) for CubeSats. I’d photographed the group previously before for MIT News, but this time the focus was on two graduate students who are working to commercialize the technology with a new company called Accion Systems Incorporated. This time I got to peek inside a cleanroom where some of the components are manufactured from silicon wafers. It was a difficult shooting environment; only a couple of pieces of equipment could be brought in, and I was wearing a full “bunny suit” which doesn’t have much in the way of ventilation. The Chronicle story is available to read here, and you can see more pictures in my archive.